*Springfest Special, May 2-9 (Thurs-Thurs) - Save $150 - was $1495, NOW $1345 (no promo code needed, tax/fees additional)! - Top of the line resilient flooring throughout the home to keep your feet comfortable. - Heated multi-bar towel warmers in all three bathrooms. You will love having toasty warm towels ready for you after your shower. All bathrooms also have upgraded light fixtures. - Beautiful upgraded cabinetry in the master bathroom along with a custom tile floor that is heated from below. The heated floor keeps the chill off the tile and makes you feel like you are in a spa. - All kitchen drawers and cabinet doors have soft close hardware (not just the drawers). This is great if you have little ones who tend to pinch their fingers. - Gorgeous custom glass tile work on the kitchen back-splash. - High end carpeting in all bedrooms with the absolute top of the line padding underneath. You might not be able to see the difference but your feet will thank you! - All bedrooms have high-end memory foam mattresses, black-out shades and upgraded ceiling fans. - All linens are provided free of charge. We make the beds with high thread-count top quality linens and all beds are completely made up and ready to go when you arrive. You will never be greeted by a bag full of sheets at the front door! - Last but not least... Televisions!! If you like watching television, get ready for the BIG time! All televisions are top of the line wall mounted Samsung high definition sets and they are big! The family room screen size is 75", the master bedroom is 65", the guest bedroom is 62" and the third bedroom set is 56." If you like to watch movies on vacation, this is the place for you! This property is only available for a weekly rental with Saturday check-in dates during the summer season. If you would like to make different arrangements in the off-season, please contact us and we will do whatever we can to accommodate you. This property is completely non-smoking. There is no smoking allowed in the unit or on the private balcony at any time. No pets, please. Your stay will be GRAND! This place is amazing!!! Where do we begin--All high end furniture, super clean and a beautiful view!! We had the best week with our extended family in this beautiful condo for a wonderful summer vacation! We loved looking out at the beach as we ate our breakfast at the large dining table, which could seat all of us. Watching many a sunrise while relaxing in the balcony with cozy seating and plush throws were a plus! We so enjoyed not to have to bring along linens and towels and also a plus was all the beach items that were supplied in the storage area. There was everything we possibly could have needed in the kitchen to prepare a meal and the Keurig and the Amazon Echo made us feel right at home! The indoor and outdoor pools kept the teen kids occupied as well! It was great for our family! We can’t wait to plan our next family vacation! When you walk in the door, all you can say is WOW! All the furnishings in the Condo are high-end and far exceeded our expectations. Great appliances, a very nice Keurig, a wine cooler that we used for our water bottles and soda cans, magnificent TV's in the living room and all bedrooms, large laundry room, big dining room table with 8 chairs, very large sectional sofa where we could sit at least 6-8 people at one time, Wi-Fi, Xfinity and linens included at no extra charge, bath towels were very nice (not the typical hotel type), awesome storage locker with everything we needed for the beach, ceiling fans and dimmer switches in living room and all bedrooms, very comfortable balcony furniture, a very accessible parking garage and we enjoyed our conversations with "Alexa". The property was very clean and the owner has kept it well-maintained. We had a minor issue with our keys, but we emailed the owner and he had the problem taken care of immediately. This year we tried some restaurants we had never been to before, and I would recommend all of them: Steamed Crabs from Higgins (Great! ), The Crabcake Factory Seafood House (Great! ), The Cowboy Steakhouse (Great! ), and The Rope Walk (Great!) I would highly recommend this property to a friend or relative, and we can't wait to go back next year. I'm a small time property manager with 2,500 check-ins. Over the years, I have come to learn what makes a good rental. Neal and his wife (the owners) have gone out of their way to create a wonderful property. I stayed for a week with my wife, two kids (2 and 5) and in-laws. The property was immaculately clean and well equipped. Beach chairs and a cart were provided. I highly highly recommend this property to anyone looking to stay at Gateway Grand. If- you are looking for an amazing condo with a view - direct oceanfront this is the place! Condo has everything that you could need and more. Really exceptional Sunrises, Oceanfront complex with indoor & outdoor pool, covered parking. Gracious Owner has beautifully decorated ,equipped the perfect 3 bedroom- 3 bath in OC. Hope to return. 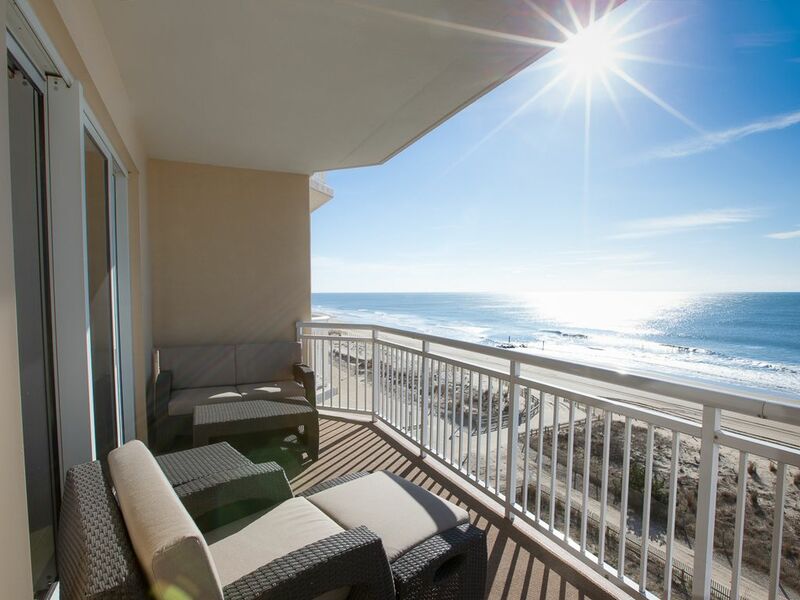 Unit 508 at the Gateway Grand is by far the best view in Ocean City! I'm not really sure where to begin - The condo was simply immaculate and beautifully decorated and the added bonus of providing the fluffy bath towels and comfy linens made our packing so much easier. The owners also provided beach chairs and plenty of beach stuff (toys, boogie boards, blankets, corn hole, etc.) in a storage unit downstairs where you could just wheel everything directly out onto the beach. What a nice surprise it was to arrive at the condo to find a welcome basket with wine and candy and a note from the owners explaining that they have paid to have a beach umbrella put out on the beach each day to claim our special spot! The kitchen was fully stocked and everything you could possibly need for preparing meals was provided. The Amazon Alexa was a huge hit and we checked the weather and it played our favorite music while we relaxed and enjoyed our beautiful views from our condo. The large dining table was able to accommodate our family of eight for dinners and we spent several evenings at the table and played board games while we enjoyed the music. There are also very large televisions in each bedroom and the television in the family room is enourmous. It was like being at the movies. This was by far the best week we have ever had with our family in ocean city!!! We will definitely return again! Gateway Grand is quite possibly Ocean City, MD's finest Oceanfront resort. Upon arrival in the beautiful lobby, you'll know right away that you've chosen the best of the best - soaring ceilings, plush seating, and a stunning panoramic view of the Oceanfront pool & dunes. Located on 48th St., these luxurious condos offer Ocean, Bay & coastal views, high-end decor, and resort-caliber amenities - such as Indoor/Outdoor Pools, Fitness Center and Kids' Game Room (with the latest video games, board games & flat-screen TVs). All of this, and just steps from the water's edge and dozens of great shops, activities & restaurants, including Seacrets (1 block), Dumser's Dairyland, Odyssea Watersports, mini-golf & more!